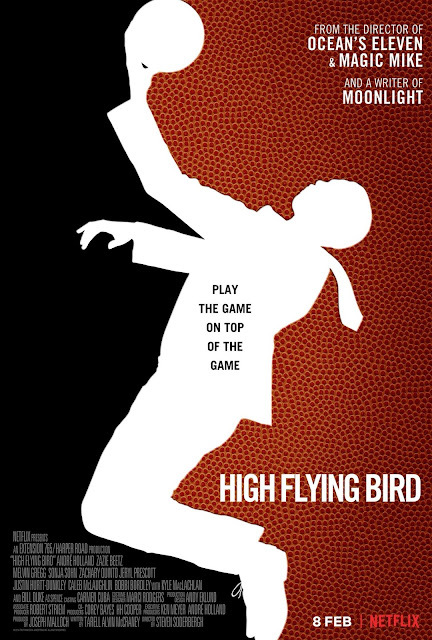 I was happy to find that High Flying Bird (2019) is very much a Steven Soderbergh film. And by that I mean that his style is all over it and it's only a sports movie in the way that Raging Bull (1980) is a sports movie. In fact, it's even less of a sports movie than that because there is literally one shot in the entire film that features any "game play". To someone like myself that doesn't like sports at all, that comes as a relief. Bird is a solid drama that focuses on the mechanics of the business of basketball, rather than the game itself. Dialogue is the centerpiece and it's crisp and concise. André Holland is magnetic and the film is never boring. I can't say it's high on my Soderbergh rankings (it feels like a TV movie) or that it's one I'd rewatch frequently, but I always enjoy his output. As with his previous film, Unsane (2018), Bird was shot entirely on an iPhone (8, with wide-angle lenses), which I didn't even know until I read about it afterward.